You may recognize Jim Nicolai’s name especially if you know about Andrew Weil, M.D., Integrative Wellness Center (Miraval) in Tuscon. Dr. Jim is the medical director at of the Miraval Health Spa and Wellness Center. The integrative approach to medicine is about treating the whole person; not just the physical symptoms. It is an all-inclusive approach to healing that uses western medicine, acupuncture, herbal therapies, chiropractic work and massage. Integrative medicine treats body, mind and spirit to help manage stress, promote wellness and create a well-balanced life. 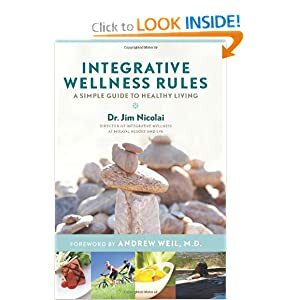 Integrative Wellness Rules is a great handbook! It covers the “rules” for creating balance and optimizing your physical, emotional and spiritual health. It is impressively comprehensive with all the information packed into 200 well written pages. There are chapters on exploring spirituality with giving and believing in magic; creating emotional health with breathing, laughter, pets and even prayer; and managing your body with proper nutrition, supplements and exercise. I particularly enjoyed the last chapter where he takes you through his day. It takes the theoretical and gives it context and reality. Dr. Nicolai has an easy to read, conversational writing style. It is obvious the he believes what he says and he loves what he does. He doesn’t lecture, preach or try to confuse the issue with unnecessary words. He does, however, entertain. The book is informative, inspirational and full of practical suggestions. And he doesn’t shy away from his beliefs in the importance of embracing spirituality as an integral part of wellness. This is not necessarily a book for everyone. If you have trouble with the spiritual aspects of health this may be hard going. I, personally, found his non-denominational easy to read and absorb. This is not a religious approach, but an intensely practical spiritual one. One that I believe needs to be discussed and written about more often. Of all the books I have read on health in the recent past, this has to be my favorite. Highly recommended!! This entry was posted in Andrew Weil, book review, Medicinal plants, Whole Food Plant-Based nutrition and tagged Andrew Weil, Integrative Wellness Center, Jim Nicolai, Wellness. Bookmark the permalink.